There’s been a lot of people that have had problems with Trixbox 1.2, not limited to, but including queues not working, the ‘Red Bar of Evil’ not reloading asterisk, dropouts after a short period of time, random audio stutterings, x-lite being unable to connect, and a pile of others. 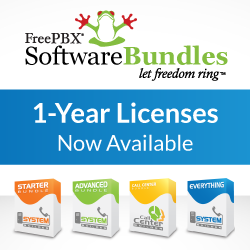 This has caused me to help a pile of people who’ve joined #freepbx (the IRC channel) to update their Asterisk to a nice standard released version. As this has happened quite a few times now, I thought it was time to spell out exactly how to do it. I actually did this for a paying customer, and step-by-step copied and pasted everything I did, so this should work flawlessly for any trixbox-1.2 based machine. Of course, this will also work on a trixbox 1.1 machine too, if you want to bring it up to date. This ensures that the zaptel modules are built for the current kernel. Update2: Upgraded the versions in this document to the latest released by Digium. Also, as you’re moving away from using trixbox’s updates altogether, ‘trixbox-update.sh’ probably shouldn’t be used any more either. I had a quick look at it, and it does a pile of stuff that isn’t needed (any more). You can just stick with doing a ‘yum update’ every couple of days to make sure that your operating system is up to date. For those that don’t want to know why or how they’re doing things, at the bottom of this article is 12 or so lines that you can copy-and-paste into a root shell of your Trixbox machine to do the upgrade. No intelligence needed! You can read along with it up here tho. The first thing you need to do is edit /etc/yum.repos.d/trixbox.repo and change ‘enabled=1’ to ‘enabled=0’. This disables the trixbox specific repository, but leaves it there for you to enable later if you want. (Note that the “cut’n’paste” script below deletes it, so if you want to keep it you might want to not copy and paste the first line of it). Then run ‘yum update’. This ensures that your CentOS installation is up to date. If you’re running a SMP machine (or hyperthreaded, or dual core), you need to do ‘yum install kernel-smp-devel’ too. Delete the old safe_asterisk script (rm -f /usr/sbin/safe_asterisk) and you’re ready to start downloading. And, finally, make sure that app_trunkisavail.so is gone, as it causes nothing but problems! Asterisk 1.2.13, Copyright (C) 1999 - 2006 Digium, Inc. and others. Asterisk comes with ABSOLUTELY NO WARRANTY; type 'show warranty' for details. certain conditions. Type 'show license' for details. Note that the version there (in bold) is 1.2.13 – the latest released version from Digium. Typing ‘quit’ brings you back to the console.